If you tuned in live to the TTL 05 event, you know that after the Hahn Estates wine tasting, I went on to my own Grocery Store Zinfandel tasting. My idea was to find 4 zinfandels in the grocery store, all under $20, and taste them live with you. A lot of people look for cheap, or at least inexpensive red wine, and I though Zinfandels would be fun for that. Quite frankly, I wanted to add Gnarly Head Zinfandel, as it’s AMAZING at $10. However, I had already posted and had friends get the wine, and I didn’t want to throw a monkey wrench into the mix. And after 5 Hahn wines, I thought 4 Zinfandel were enough! However, I would honestly recommend it over the 4 wines I reviewed for the night, so give it a shot if you can find it! Of course, this video has the entire tasting, and I’d love for you to watch it. It was filmed after a 5 wine tasting, and well, frankly, I was a bit happy. As was Robin, who did join for some of it. If you don’t make it through the whole video, I’ve summarized all of the wines in the blog post. First up was the Estancia Paso Robles 2005 Zinfandel which cost $13.50 at our local grocery store. I believe this was a “request” since many people have seen it in the store. The wine clocked in at 13.5% Alcohol by Volume (ABV), and was aged 8 months in American oak, 25% new. This ended up being the first, and only, wine I spit during an event. There was nothing on the nose, maybe some cranberry and white pepper, but that was likely reaching for something. The palate was quite awkward, with little fruit, no spice, no smoke, no flavor. I quickly moved on, until someone made us pause. Kirsten Wright tried to turn a negative into a positive, and had a great idea. Stuck with an “unpleasant” bottle of wine, she thought this would be a great candidate for Sangria. I think with enough doctoring, it would definitely be a nice sangria wine. Though at $13.50, I am sure there are more cost effective wines to do this with. Brava, Kirsten, for thinking outside the wine box. We moved on to the Cline Ancient Vines Zinfandel 2007, which was $16.50 in our local grocery. While grape vines are considered Old Vines from 40 to 80 years, they are considered Ancient when they are 80 until about 100 years of age. While the 14.5% ABV is listed on the bottle, I couldn’t find a good data sheet on the wine, so I am not sure of the aging method. The Cline Ancient Vines Zin was ruby red in color, and had a bouquet of raspberry with mocha or chocolate as well. My video doesn’t express it eloquently, and I blame the 6 wines prior, but as soon as you bring the wine to your lips and take that breath in, the bouquet, or aroma, encourages a mouth watering moment when you can literally taste the fruit forwardness of this wine. The palate of the Cline Ancient Vines Zinfandel is quiet silky and smooth in the mouth, with a tremendous amount of fruit. A mixture of raspberry and blackberry flavors are present in this new world red. While it didn’t have noticeable tannins, and there wasn’t a big presence of spice or earth or smoke, it would indeed pair well with steak or even pasta. Though $16.50 precludes the Cline from being an every-day sipper in my book, it was certainly nice enough to have as a casual drink with friends. Next up was Ravenswood’s Zen of Zins 2006 Old Vines Zinfandel. At $10.50, it was certainly the most inexpensive of all of the wines of the night, though not the best. It had a very dark nose, with a good bit of spice on it. The scent of chocolate covered raspberries came through, and it was interesting. The palate was smooth, but really doesn’t bring a lot. The Zen of Zins had no discerning flavors, and did have that soapy mouth feel that makes you want to wash it out. It was light in the mouth, had no spice that the bouquet held, and while it “complimented” the goat cheese torta, it really didn’t do much in terms of flavor. I’d say this would be a decent table wine, pleasant but pedestrian. Frankly, at $11, there are much better wines to try. The last wine of the night was the 2006 7 Deadly Zins, Lodi California, which was $18.50 in our grocery store. This was certainly the priciest wine of the night, and an interesting side note, cost only $11 for a friend, Lynn, in California, who was tasting along with us on the video. The nose had a nice raspberry bouquet, and had some nice spice that reminded me of a Christmas candle. The palate was quite interesting, and really reminded me of candied fruit, and well, Hubba Bubba Bubblegum! Not something you look for in a wine, usually, but it wasn’t terrible! A number of my friends who were tasting along with me said it was a sweet sipper and Rebekah and her girlfriends loved it. The 7 Deadly Zins was not sickly sweet, and a number of the tasters who joined us via ustream video chat said it would be a great porch wine. I had to agree, but would do so if you could find it for the $11 that Lynn can. At $18.50, the 7 Deadly Zins was just a bit too expensive to be in the porch wine category when there are SO many other wines to try at a better price. I really was not crazy about the outcome of this tasting. I enjoyed the Cline Ancient Vines Zin, perhaps my favorite of the night, but didn’t get WOWED! Therefore, I just went to the store and bough 7 more Zinfandels. 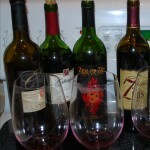 There will be a Zin Tasting event, soon! Speaking of events, please tune on on 2/28 when Debbie Frangipane and I host a live Italian food and wine tasting event in Tampa. We will have 15 people with us, and will be streaming live on my ustream channel. You can get some details of the event on the twitter taste live event page.